Oconee County voters ended the year concerned about over development, traffic problems, and their schools. Concern about road and traffic problems was up dramatically from two years ago, when the economy had been the major concern of voters in the county. Even in that period of economic uncertainty, Oconee County voters had been concerned about over development, and they expressed the same level of concern about their school system then as now. In both years, some of the concern about the school system resulted from what voters saw as the stretching of resources because of growth in development in the county. The promotion of economic development by county officials is met with opposition by at least a number of county voters, and only a small number of voters in 2014 encouraged the county in its efforts to promote economic development. 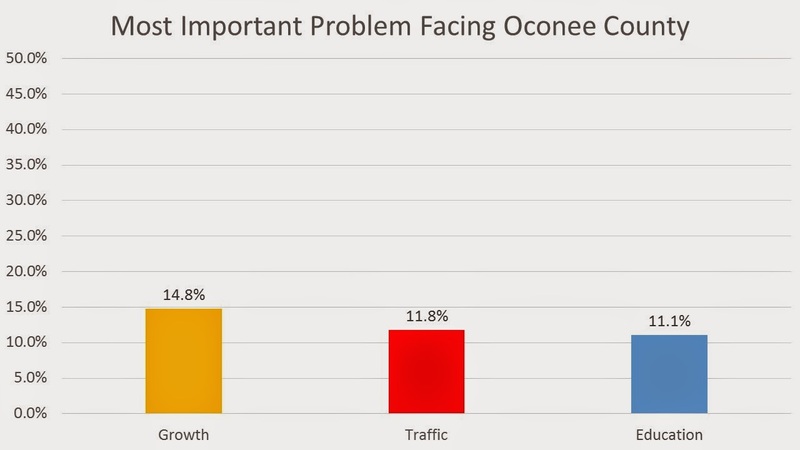 These findings comes from scientific surveys conducted in the autumn of 2012 and again just before the November election last year that asked voters to name the most important problem facing Oconee County. In both years, many of the voters did not have an answer to the question. And in both years, a small number of voters said explicitly that the county had no problems. Among those who mentioned a problem in 2014, 21.3 percent said growth was a problem, and 16.9 percent said traffic on the county’s roadways was a problem. Among all voters surveyed, 14.8 percent said growth was a problem, and 11.8 percent said roads and traffic were a problem. In 2012, 14.3 percent of those who identified a problem named growth, and 3.2 percent named roads. Among all those surveyed in 2012, 11.7 percent named growth and 2.7 percent named roads and traffic. Graduate students in a research methods class I teach at the University of Georgia conducted the survey each year, under my direction. The class project is designed to help students learn about scientific sampling, surveys in general, and data analysis. Each year, the students drew a simple random sample from the county’s list of registered voters, which I purchased from the Secretary of State office. In 2014, the students completed interviews with 297 of the 999 names drawn for the sample, or 29.8 percent. In 2012, the students completed interviews with 188 of the 760 registered voters randomly selected, or 24.7 percent. In both years, the students completed the interviews by telephone, in person, through the mail or online. In both years, the characteristics of those interviewed matched the characteristics of registered voters in terms of gender, race, precinct of registration, and year of registration. The margin of error for the survey in 2014 was 5.7, while it was 7.1 percent in 2012. The error term signifies that the odds are 19 to 1 that the responses from the sample would reflect within plus or minus 5.7 percent in 2014 (7.1 percent in 2012) those of registered voters in the county had all voters been interviewed. In fact, given the high percentage of registration in Oconee County, it is unlikely that the results would have been radically different had the survey been conducted with persons 18 years old or older rather than just with registered voters. The U.S. Census Bureau estimates that Oconee County has 24,914 residents 18 years old or older. The county’s active voter list for the Nov. 4 election this past year was 24,914, suggesting that more than 90 percent of the county’s voting age population is registered. In each case, the question was about half way through the 15-minute-long survey. In 2014, the question followed questions on the liquor-by-the-drink referendum and the referendum on the Special Purpose Local Option Sales Tax. The students–or respondents online–recorded the responses to the most important problem question verbatim. I read through the responses and classified them based on their commonality. A total of 44 persons mentioned growth as a problem in 2014 (14.8 percent of all those surveyed), followed by 35 who mentioned roads and traffic (11.8 percent) and 33 (11.1 percent) who mentioned schools. The next most common response was crime, given by 13 of the respondents (4.4 percent of 297). This was followed by the 11 persons who said there was no problem (3.7 percent) and eight voters (2.7 percent) who mentioned taxes and the same number who mentioned liquor as problems. The mention of liquor no doubt was triggered by the question on the referendum, and most of those said the lack of liquor was a problem. Five people mentioned the need for further development (1.7 percent), and three mentioned a weak economy (1.0 percent). “There is too much commercialization and a loss of rural properties,” another said. The comments about the schools were quite varied. Some of the questions didn’t fit into my categories. Two of the voters complained about the county’s “embarrassing Congressional representation” and “poor representation in Congress.” Paul Broun, from Oconee County, is the county’s elected member of Congress until the new Congress convenes later this month. The concern with the economy was clearly dominant in 2012, with 41 (21.8 percent) of the 188 respondents mentioning the economy or jobs as the major problem facing the county. But clearly, at that same time, voters were cautious about growth. Twenty-two voters (11.7 percent) mentioned growth as a problem, even in the weak economy. Only five voters in 2012 (2.7 percent of 188) mentioned roads and traffic. The question on liquor-by-the-drink indicated that 67.3 percent of the voters in the sample approved of the referendum, while 53.9 percent approved of the 1 percent SPLOST referendum. The actual votes in the Nov. 4 election were 65.4 percent in favor of the liquor referendum and 65.1 percent in favor of the SPLOST referendum. After I posted the story on the survey results regarding the liquor-by-the-drink referendum, I downloaded from the Secretary of State the voting history file for 2014 for Oconee County. That file indicates that 198 (66.7 percent) of the 297 surveyed voters actually voted in the Nov. 4 election. Of those 198 voters, 66.2 percent favored the liquor referendum when surveyed and 57.6 percent favored the SPLOST referendum. The survey suggests that more of those who voted for SPLOST made up their minds late in the election than was the case for those who supported the liquor referendum.